A little behind, but here are my January do.Good Stitches Harmony Circle blocks. 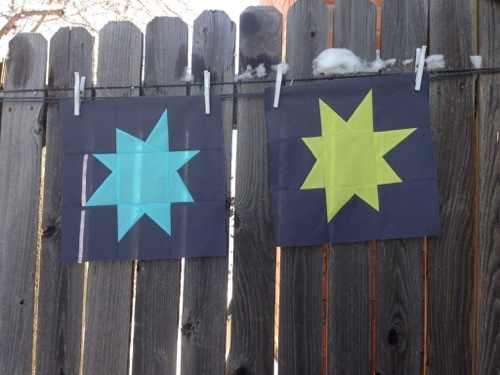 January called for wonky stars in cool colors on grey, so, ta-da. As it was all from stash, I have no idea what fabrics I used. I DO know that I used this tutorial from The Silly BooDilly. Sadly, it looks like February will be the last month I’m in the circle. I’ve asked Rachel to find me a replacement. 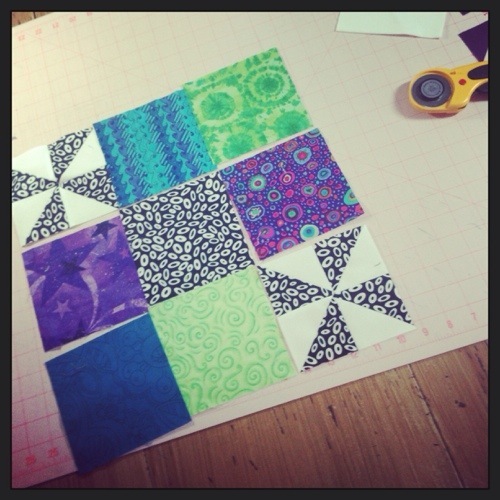 Life is getting in the way, and etc etc etc… Meanwhile, I’ve got to get to work on the February blocks– aren’t they cool? 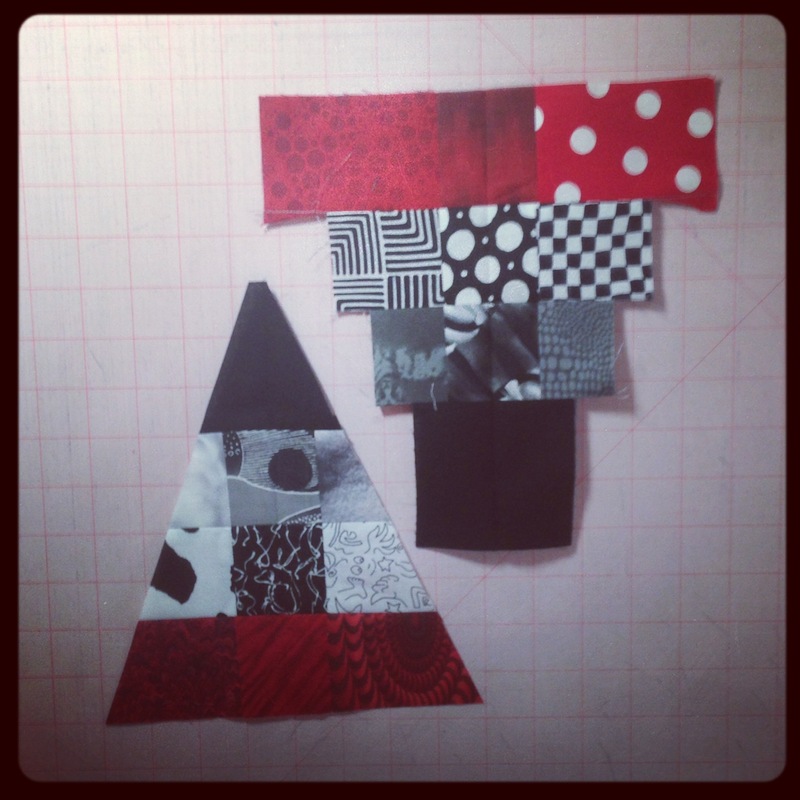 What are YOUR sewing plans for the weekend? The color scheme this month is anything goes. Kind of stressful- but someone else finished theirs first, so I tried to keep sort of near her scheme. Mine came out bolder and brighter, which is probably par for the course for me. The trickiest part was laying out the strips in the right order. How to pick? But I did… and I ended up with two blocks that made me very happy. Yup, I’m totally addicted. I happen to have a huge pile of 2″ strips leftover from my (ahem, sadly still in progress) Modern Cross quilt… They have been waiting for just the right project- and this might be it. How long would I cut the strips if they are 2″ instead of 2.5″? How big will the blocks finish? Yikes- even though I had an entire month to create these 2 relatively simple blocks for the Harmony Circle of do.Good Stitches, I didn’t manage to get them done and mailed out until the first week of November. I have zero excuses, especially because, as you can see from the photos below, the colors were totally up my alley! 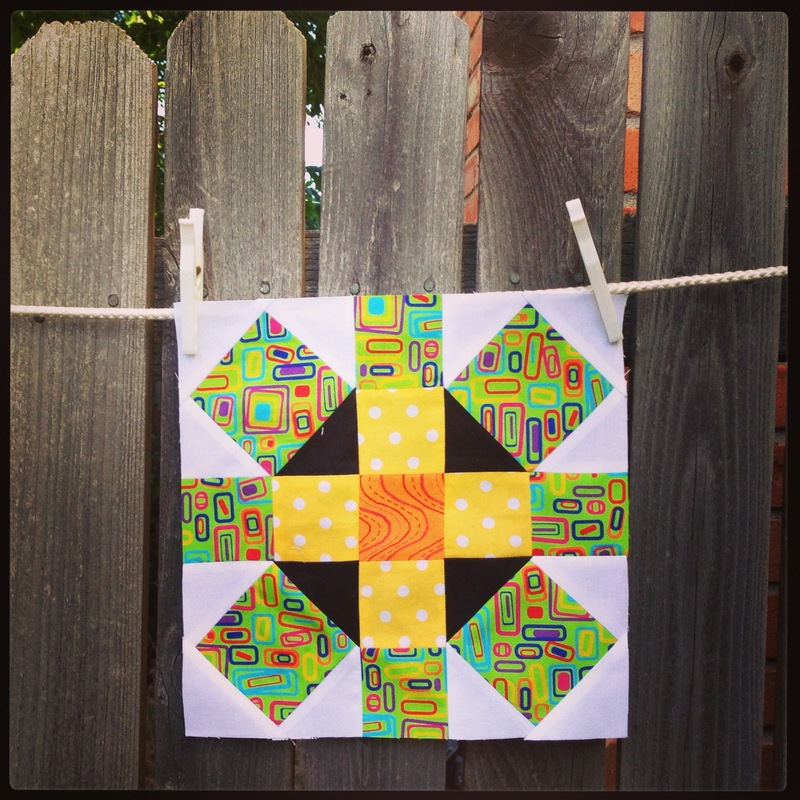 This month’s block was created from a tutorial over at Clover & Violet. It’s a simple block with a nice impact. 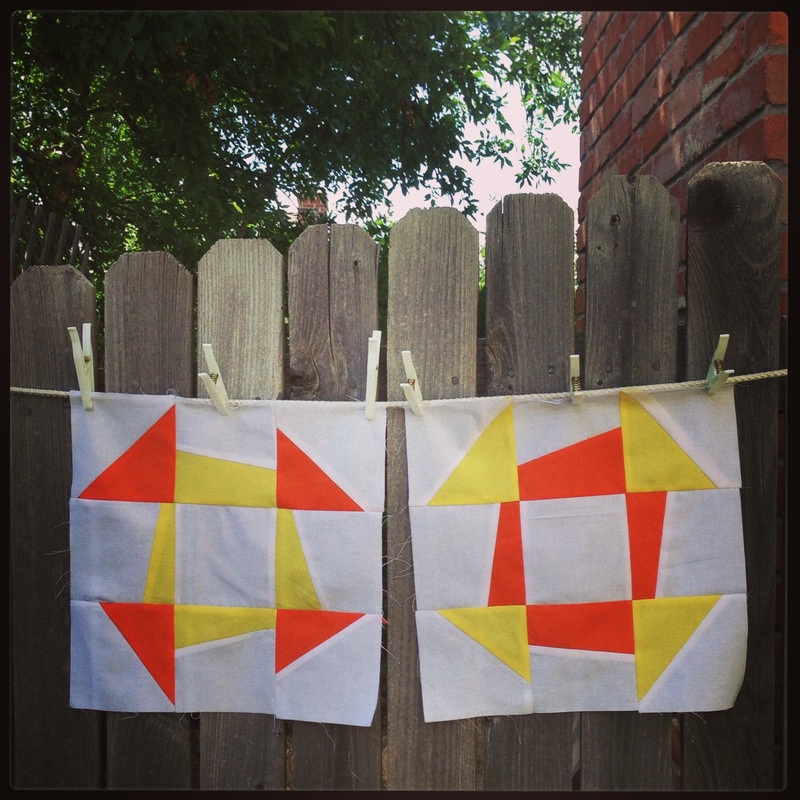 Make 2 pinwheels, cut 7 other squares, sew together and chop apart and sew back together, and you get… this. 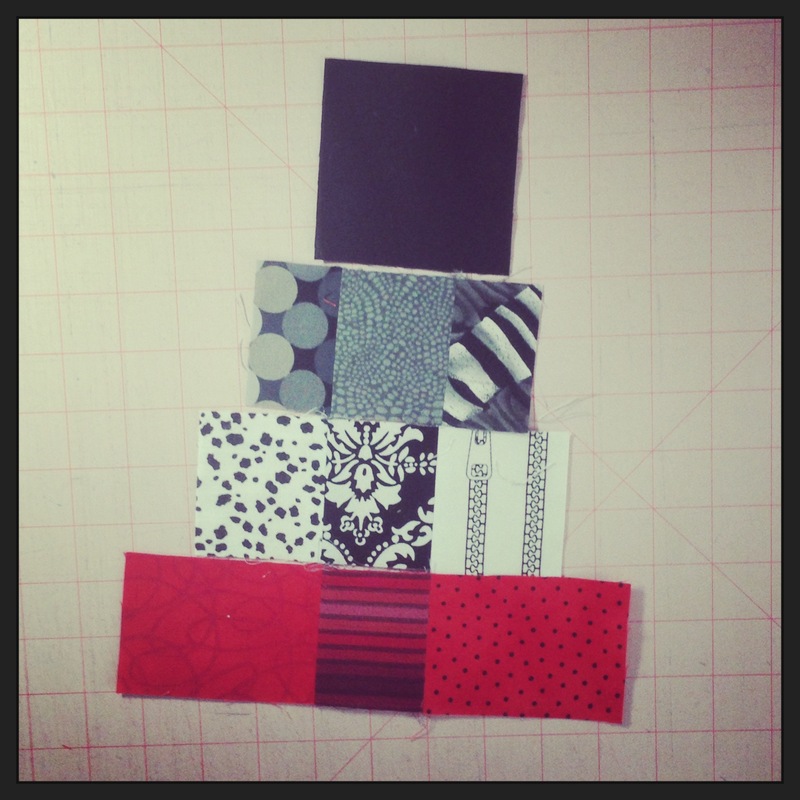 I used the same colored fabrics in each block but switched up the black and white print. 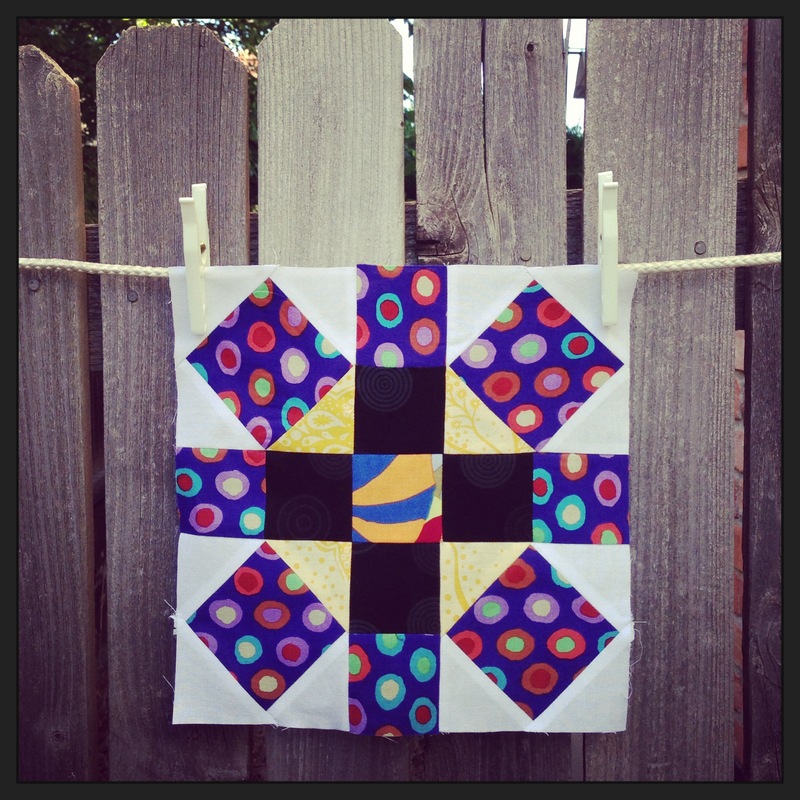 Meanwhile, in the group pool, photos of finished quilts including my blocks have been posted! Since I only joined the Circle a few months ago, this is super exciting to me. 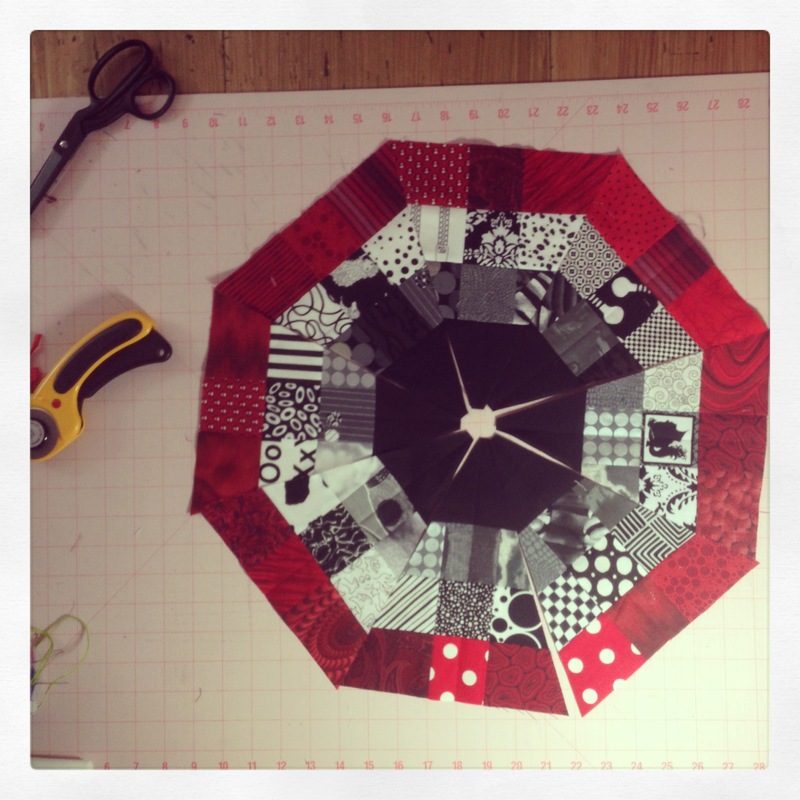 See the finished Octagonal Orb quilt (July) here– (not my Flickr photo and it’s not set up for sharing) and my block here. 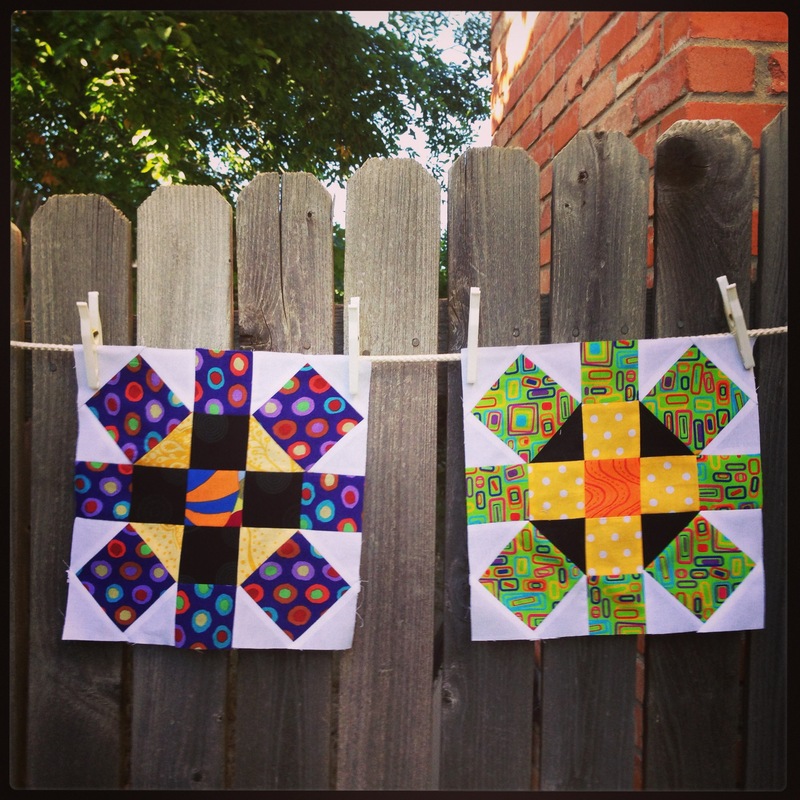 …and my blocks here… I hope those quilts go out into the world and spread happiness! Linking up with Finish It Up Friday and TGIFF. I’ve got not one but TWO finishes under my belt this week- both quilty and knitty. I got it in the mail Monday, and hopefully it has already reached its new home. Looking at it now, I wish I had put the bright blue and pink inner logs further out, but oh well. I’m so glad I got to use those fun little birdies again! And now, the knitty finish. A(nother) pair of socks, of course… These should have been the fastest socks ever. I had knit the pattern (Sarsaparilla by Cookie A, from the October 2012 club shipment) before and I adore it. The first sock flew off my needles in under a week. I cast on at a Saturday night Rockies game, and kept going on a Monday game- and even with 2 games in 3 days, I managed to miss Todd Helton’s 2,500th hit. Ah, well, we still had fun. But the second sock? It took me forever. I took it with me to the beach, and I was frantic that it wouldn’t be enough knitting to last a week. But the truth is, I barely picked it up all week, even on the 6 flights (denver to funeral, funeral to beach, beach to denver). I was feeling so mellow, I was past knitting. Which I thought was impossible- who knew? And then when we got home, I cast on for Henry’s giant Xmas gift- a nearly bed sized knitted minecraft blanket. I’ve done the match, and I should just barely squeak it out in time for the big day. So I decided I could only knit the socks at work. And they barely grew. And then the yarn broke not once, not even twice, but THREE times within the last inch of the toe. Grrrrr. That was an excessive amount of end weaving to have to do for a sock. Last night I gave up and broke my own rule, and finished the toe at home. Finally. And these socks have turned out to be nearly impossible to photograph. In the in-progress shot, you can really see the cables. But not in these… I love this pattern, and I think I will eventually end up making one more pair, in a completely solid yarn, so the cables will shine as they were meant to. Here’s hoping it’s warmer where you are, and that you had some good finishes this week, too! Ever sit down to work on what should be a super simple project, only to make mistake after silly mistake? The August block for the Harmony Circle of do.Good Stitches was like that for me. The month’s hostess specifically picked a super easy block, a Wonky Churn Dash, because of summer travel, back to school, and all that jazz. It was very thoughtful, and I was relieved. We spent part of August on an amazing European vacation, and I didn’t get to start the blocks before I left. When I got back, we went immediately back into school/work mode. I barely had any time to work on the blocks, but no biggie, because it was so simple. Spatial relationships are not my strongpoint. Which might be a tiny understatement. I didn’t have solid scraps in the colors required for the blocks, so I tried to cut pieces to the right size, without wasting fabric. Yeah, didn’t work. At all. 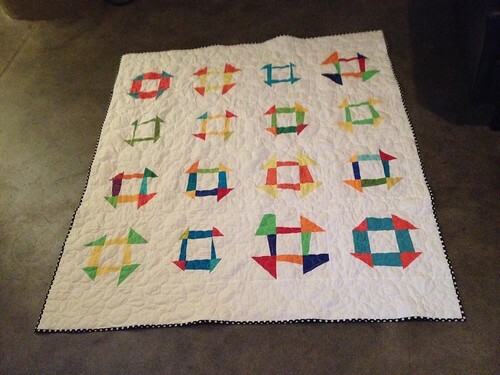 I stitched and flipped and realized my colored bits weren’t big enough to make my squares the required 4.5″. And then I ripped (and had to cut all new colored bits because my estimates were so very very off) and stitched and flipped and swore because they still weren’t right. After a few rounds of this delightful process, I had 2 finished blocks. But one had a lumpy seam and corner piece that just looked wrong. I was past the point of being productive, so I abandoned them. Later in the week, I came back, ripped apart the bad block, and fixed it enough that I wasn’t embarrassed to mail it out. You’d never guess by looking how much misery I was caused by these innocent little blocks. Linking up at TGIFF and Finish it up Friday. Our summer schedule is so nutty (travel! camps! late sunlight that makes you want to play outside!) that I have lost nearly all of my sewing time. When I found a few unexpected moments on Monday, I realized that I had better get my July Harmony Circle block done NOW, just in case. This month only called for one block, as the pattern chosen was both larger and more elaborate than normal. What pattern, you might be asking… It turned out to be one I pinned ages ago because I thought it was so lovely- but that I had never gotten around to attempting. 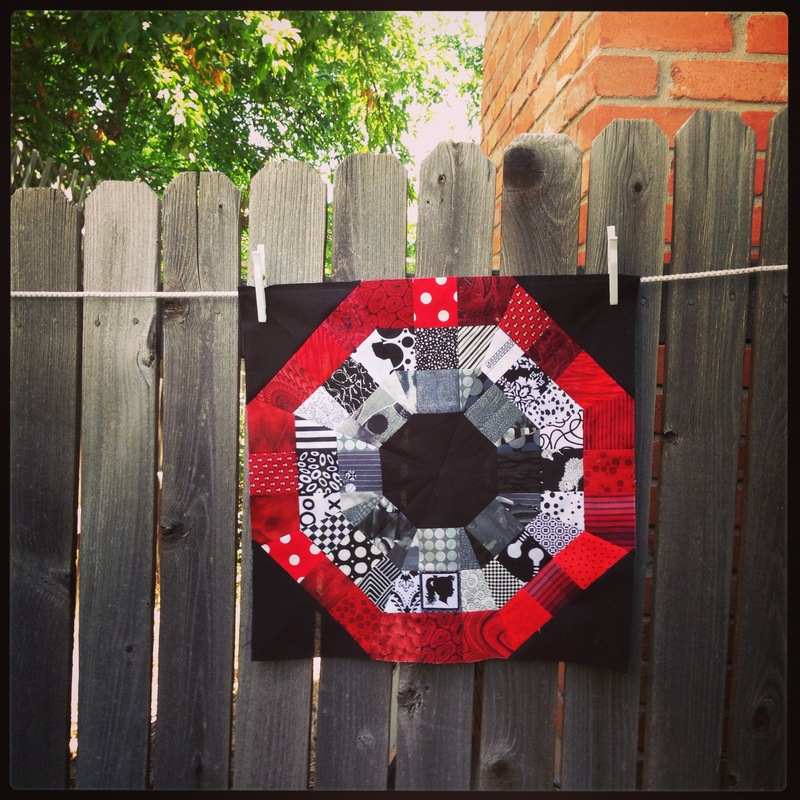 It’s the Octagonal Orb by oh fransson for the Modern Quilt Guild. 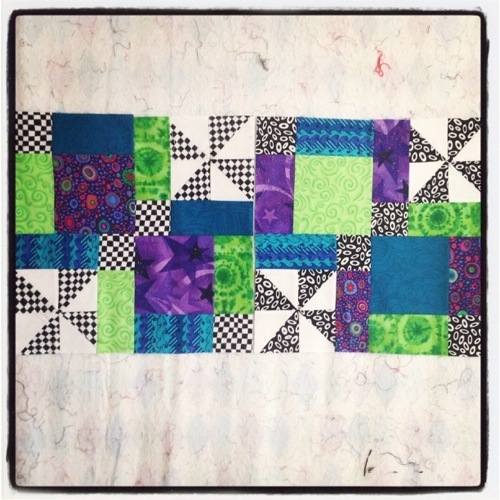 It’s a gorgeous block, and while there’s a lot of cutting up front, the piecing itself isn’t too challenging. It’s probably not surprising to anyone that a lot of those B&Ws were novelties… The block calls for 24 2.5″ squares, and I managed not to use any print more than once! I DID double up on the other colors, as my stash just wasn’t varied enough in those colors to pull off 24 different reds or grays. 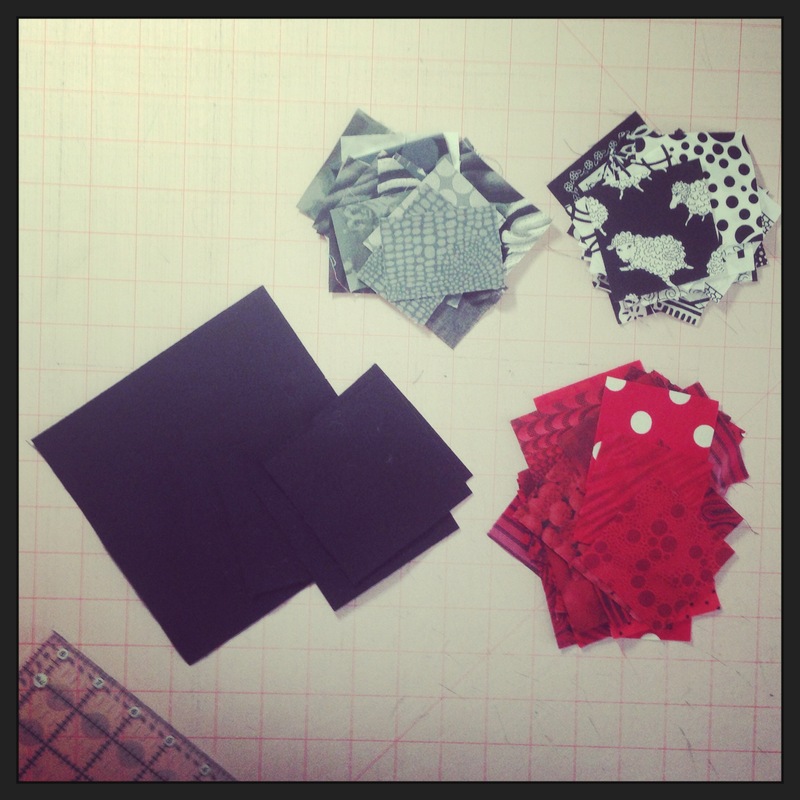 Selecting and cutting fabrics probably took me as long as piecing the entire block! Then, you cut them down w/ the help of a template. My stash of template plastic decided to hide, so I very very carefully cut from a paper pattern. All the triangles go together, then you add the background. 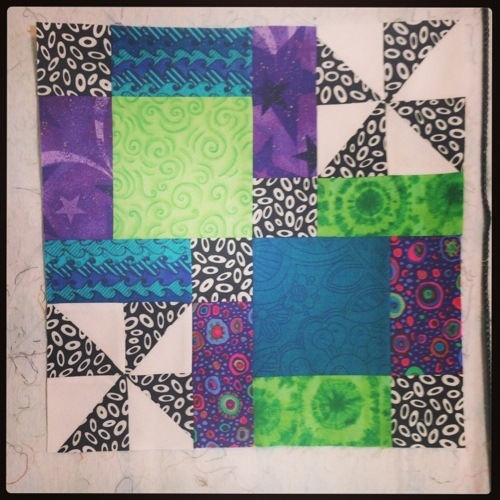 Of course, the first month, I had a baby quilt to finish and a trip to take… But, just under the wire, I did get my June blocks done (phew). 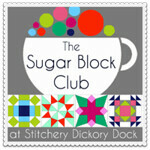 I was pretty amused as the pattern was very very similar to the June Sugar Block Club pattern. The colors were to be “boy”, and the fabrics suitable for an older boy, all on a white background. 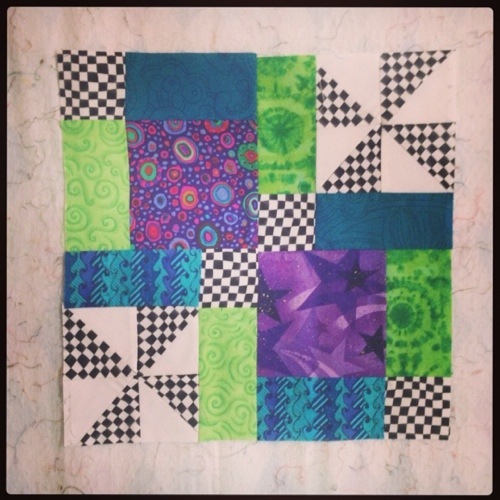 Much of the blocks came from my scrap bin, which felt very very good! There’s some Mably, Kaffe, Anna Maria, Michael Miller, and random otherness as well. 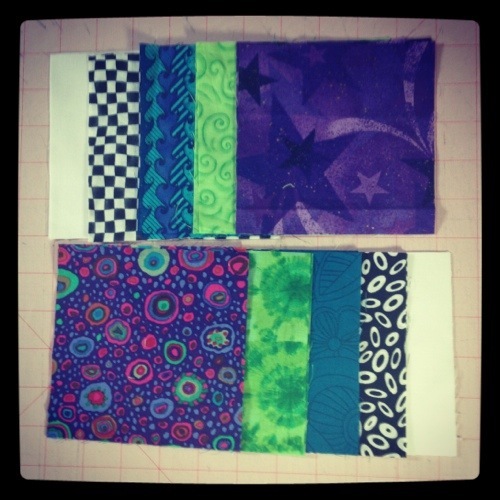 My fabrics seem like they may be a bit brighter than those in some of the other blocks, but I think it will be okay. I’m mailing them off first thing in the morning- here’s hoping they fit the bill! And just think, next week it will be July, and time to start all over again.